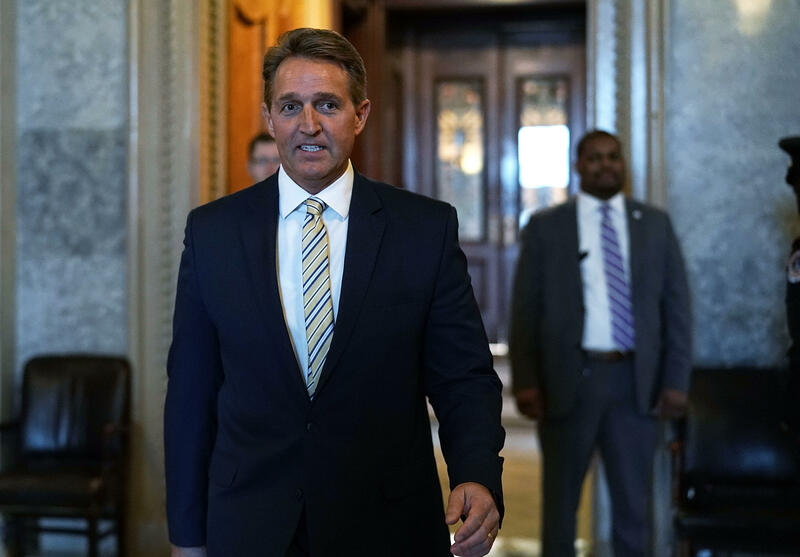 Sen. Jeff Flake, R-Arizona, delivered a rebuke of President Trump on the Senate floor Wednesday, in a speech that drew a comparison between Mr. Trump and Soviet dictator Joseph Stalin and called for greater protections of the truth and members of the press around the world. In his remarks, Flake called out Mr. Trump's repeated attacks on the news media, saying it's an "assault as unprecedented as it is unwarranted. "Mr. President, it is a testament to the condition of our democracy that our own president uses words infamously spoken by Josef Stalin to describe his enemies," reads the excerpt. "It bears noting that so fraught with malice was the phrase 'enemy of the people,' that even Nikita Khrushchev forbade its use, telling the Soviet Communist Party that the phrase had been introduced by Stalin for the purpose of 'annihilating such individuals' who disagreed with the supreme leader." "When a figure in power reflexively calls any press that doesn't suit him 'fake news,' it is that person who should be the figure of suspicion, not the press," he's also expected to say, according to the excerpt. He added that damage done by the "sustained attacks" by Mr. Trump would not be "confined" the president's time in office, noting his demeaning words inspire dictatorships worldwide. "This feedback loop is disgraceful, Mr. President. Not only has the past year seen an American president borrow despotic language to refer to the free press, but it seems he has in turn inspired dictators and authoritarians with his own language. This is reprehensible," said Flake. He added, "Here in America, we do not pay obeisance to the powerful - in fact, we question the powerful most ardently - to do so is our birthright and a requirement of our citizenship -- and so, we know well that no matter how powerful, no president will ever have dominion over objective reality." Flake said the issue of the protection of the First Amendment and the truth dates back to the founding fathers and that "no politician will ever get to tell us what the truth is and is not." "Anyone who presumes to try to attack or manipulate the truth to his own purposes should be made to realize the mistake and be held to account. That is our job here. And that is just as Madison, Hamilton, and Jay would have it," added Flake. He also called on Democrats and Republicans to unite and become "allies of truth." "2018 must be the year in which the truth takes a stand against power that would weaken it. In this effort, the choice is quite simple. And in this effort, the truth needs as many allies as possible. Together, my colleagues, we are powerful. Together, we have it within us to turn back these attacks, right these wrongs, repair this damage, restore reverence for our institutions, and prevent further moral vandalism," said Flake. Besides longtime target CNN, the president has picked fights with outlets like the "failing" New York Times and the Wall Street Journal, despite giving interviews with the news organizations. Find a full transcript of Flakes remarks on the Senate floor here. "Mr. President, the question of why the truth is now under such assault may well be for historians to determine. But for those who cherish American constitutional democracy, what matters is the effect on America and her people and her standing in an increasingly unstable world -- made all the more unstable by these very fabrications. What matters is the daily disassembling of our democratic institutions," says Flake. He adds, "We are a mature democracy - it is well past time that we stop excusing or ignoring - or worse, endorsing -- these attacks on the truth. For if we compromise the truth for the sake of our politics, we are lost." After Flake ends his remarks, Sen. Amy Klobuchar, D-Minnesota, stands and offers her support of her Republican colleague, saying the issue of defending freedom of speech and the press is a personal one. "We need this protection of the First Amendment now more than ever," she added. Flake calls the "predictable habit of calling true things false and false things truth" a "recipe for disaster." He adds, "Any of us who have spent time in public life have endured news coverage we felt was jaded or unfair. But in our positions, to employ even idle threats to use laws or regulations to stifle criticism is corrosive to our democratic institutions. Simply put: it is the press's obligation to uncover the truth about power. It is the people's right to criticize their government. And it is our job to take it." Flake says the president is spreading an "untruth" by continuing to criticize Special Counsel Robert Mueller's investigation into Russian meddling as a "hoax." "To be very clear, to call the Russia matter a "hoax" - as the president has many times - is a falsehood. We know that the attacks orchestrated by the Russian government during the election were real and constitute a grave threat to both American sovereignty and to our national security. It is in the interest of every American to get to the bottom of this matter, wherever the investigation leads," says Flake. Flake calls on GOP, Dems to be "allies of truth"
"The truth takes a stand against a power that would weaken it. The truth needs as many allies as possible, together my colleagues we are powerful together we have it within us to turn back these attacks, right these wrongs, repair this damage and prevent further moral vandalism," he adds. Flake cites findings from the Committee to Protect Journalists that show reporters have been jailed across the world for doing their jobs. "A sustained attack on the truth will not be confined to this president," he says of the president's repeated attacks and its influence across the globe. Flake compares Mr. Trump's statements of "fake news" to that of Soviet dicatator Joseph Stalin. "This alone should be a source of great shame for us in this body, especially for those of us in the president's party. For they are shameful, repulsive statements. And, of course, the president has it precisely backward - despotism is the enemy of the people," says Flake. He adds, "The free press is the despot's enemy, which makes the free press the guardian of democracy. When a figure in power reflexively calls any press that doesn't suit him "fake news," it is that person who should be the figure of suspicion, not the press." "Our freedom has been predicated on truth," Flake begins in his speech on the floor. He notes the idea of freedom of opinion has dated back to the nation's founding fathers. "I rise today to talk about the truth and the truths relationship to democracy, for without truth," he says, "our democracy will not last." In excerpts of the speech released on Tuesday, Flake dismisses Mr. Trump's attacks as "an affront" to journalists "commitment" and "sacrifice" as hundreds are jailed around the world for trying to report. "Mr. President, a new report from the Committee to Protect Journalists documents that the number of journalists imprisoned around the world has reached 262, which is a new record. This total includes 21 reporters who are being held on "false news" charges," Flake is set to say in remarks.